There are many wonderful things to see in and around Huatulco. 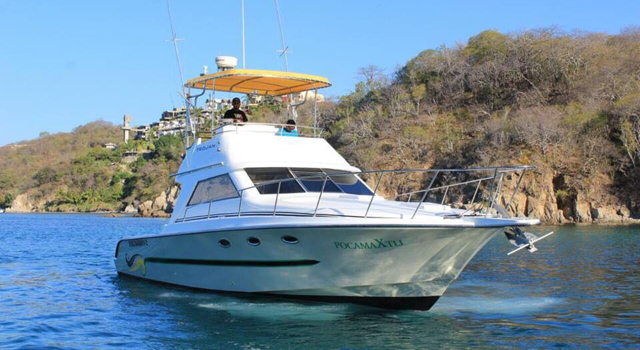 I will take you on a boat tour of the 9 bays of Huatulco. Many of our 32 beaches are part of Bahias de Huatulco National Park / Huatulco National Park. Because of this they are protected and are pristine. We often have the beaches all to ourselves! My boat, the Black Pearl, can hold up to 10 people comfortably. I have enough life jackets for everyone in both adult and child sizes. I'll bring my cooler full of refreshments too. Along the way we will catch fish; you can reel them in! We always see rays and turtles and we often also see dolphins and whales! My boat tours of Huatulco can last anywhere from a couple hours to all day. We can go as long as you like. We can stop and snorkel at 2 or 3 places along the way and have lunch at one of the many beach restaurants. If you catch a fish along the way, the restaurants will prepare it for you for a great price. This is the range of hours available. 6:30 am is the earliest start time; we can meet anytime after this if you prefer. Typical tours are anywhere from 2 hours to 8 hours in duration. I do NOT offer multi-day tours. Our departure point is the marina at Bahia de Santa Cruz. Depending on where you are staying I can provide transportation to the marina. *All payments are cash only. Currencies accepted are USD, CAD and MEX, please email for latest currency conversion rates if you are not paying in dollars.